This section will explain how to virtually partition out your harddrive so that you have not only your main drive (C: ) but you also have an additional Data drive. This will be useful in the ‘shared folders’ and ‘backup’ tutorials. First, however, we’re going to skip ahead to do a defragmentation of the drive for the best results. To accomplish this, Click Start, All Programs, Accessories, System Tools, and then Disk Defragmenter. The built in windows defragmenter will work just fine for what we need it to do. Click Analyze Disk – This will determine the amount of fragmentation. Since this tutorial is intended for new Windows installations, the fragmentation should be very minimal. If you’re reading this tutorial and applying to an existing Windows 7 installation, then you may expect a higher fragmentation percentage and a longer wait time for defragmentation. Next, Click Defragment Disk – Defragmenting a hard drive organizes the files in such a way that they are in the same physical location on the disk. What is fragmentation in the first place you ask? This will be explained in the “Defraggling” section, and yes, there is a reason I named it “Defraggling”. Once the defragmentation is complete, continue on with this tutorial. Next, we’re going to partition out the Harddisk to make separate partitions. Click on Start, right click on Computer and select “Manage”. C: will be selected by default. You should now see a screen similar to this. 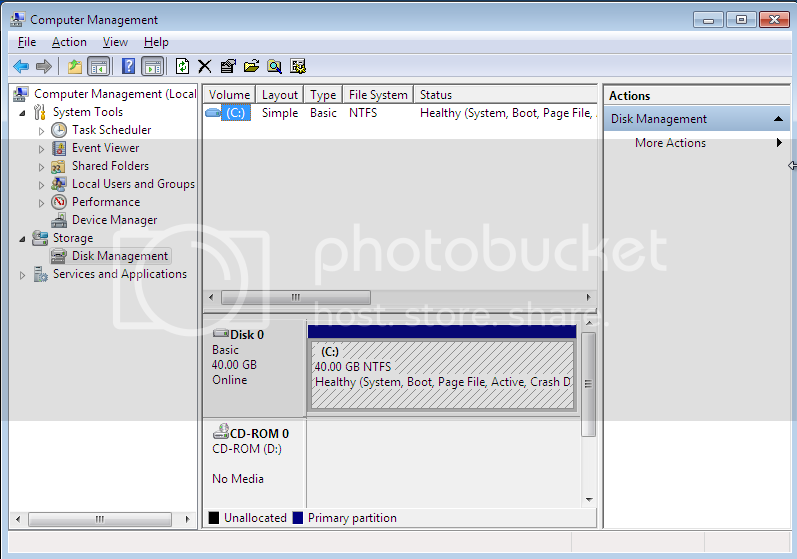 The bottom section of the window shows you the different partitions that are housed on the physical harddrive. 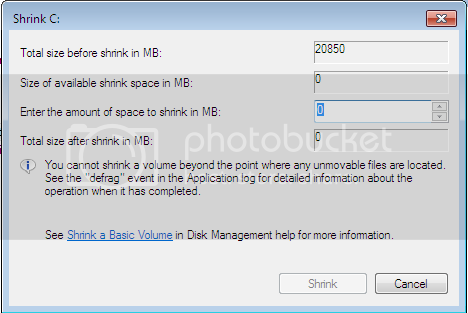 For the amount of space you wish to shrink, if you plan on installing a large number of programs, then let’s go with an 80GB Drive C:, if you don’t plan on installing a large number of programs, then we can probably stick with a 60GB Drive C:, however the choice is up to you. If you really don’t know what you want, a very comfortable number would be 100GB, this is ample room to expand your program lineup. How, though, do you get the correct number of MB to shrink? 2. Subtract the total number of megabytes you wish drive C: to be changed to. How do you get a good number? Use a converter to determine the total number of megabytes that equal the desired size in Gigabytes. 3. Enter the result of your equation into the “Enter the amount of space to shrink in MB:” field. Click Shrink when you have the correct amount input. Notice that there is now a black section on Drive C: . This is no longer part of Drive C: but is now “unallocated” space. What we’re going to do now is use the unallocated space to create a new virtual Volume or Drive. Name the drive whatever you would like, but make sure that you enable File and Folder compression. Now click Next and you will be presented with the summary screen. Click Finish to start the creation of the Drive. It will take a few moments to format and properly setup the drive. Congratulations, you have successfully partitioned out your drive. This will be beneficial when setting up backups and shared folders. Thank you for the guide. I have a question: I did partition the HD in my laptop using this guide. Can I also install Linux in this new partition? You can actually. When you insert the Linux CD and boot from it, it should display the two separate partitions. 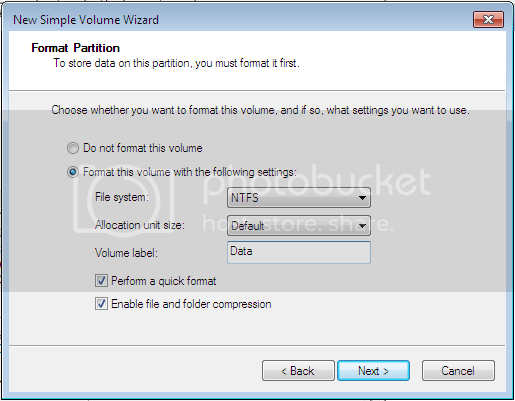 *Note that if you formatted the partition in NTFS, Linux will need to reformat the partition to ext4. You also have the option of installing Linux inside Windows using a Wubi installer. If you choose to do a Wubi install, I would put it on the C: Drive so you also have access to the newly created Data drive.